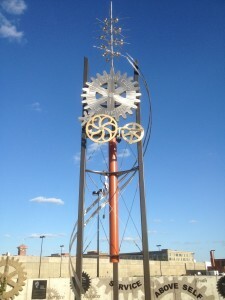 Americlock produces high end architectural clock tower designs that creates elements that add character and define space. We turn an ordinary space into something extraordinary with our custom architectural pieces. Our professional staff will work with your architect, artist, or company and will help design and then build a custom structure. Any custom feature that an artist can envision can be brought to reality by our craftsmen. Contact us with your project and let us turn your space into a landmark. Americlock designs and fabricates globes from 3 feet to 30 feet in diameter using aluminum, copper, stainless steel, and brass. These magnificent sculptures, still or rotating, make an artistic impression, enhancing any location where displayed. A globe is a wonderful architectural feature, both useful and impressive. Globes can either be stationary, or rotating to create a more interesting feature. Some of our notable globes can be found at the University of Illinois or the Waldorf Astoria Hotel in Dubai.